Mauritius has miles of sugar cane fields. It has vanilla and pineapples and lychees. It had the dodo bird, its national symbol, until that was hunted to extinction in the 17th century. And it has Rum. In fact, Mauritius recently became one of the few places in the World to produce two types of Rum, both molasses and agricole. Until 2006 there was a prohibition on the production of agricole – Rum made from sugar cane juice – as the island was so heavily reliant on its sugar-refining industry, but with the lifting of that ban came a minor explosion of the product and Mauritius is now setting out its stall as a global provider of Rum. Among them is Gold of Mauritius Rum and the craft team behind it, led by Frederic Bestel. 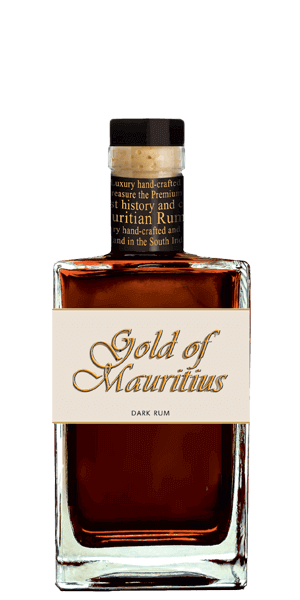 Gold of Mauritius Dark Rum is made with molasses, held in Port wine barrels for three months before going through filtration and adjustment then spending a further eight to 12 months in barrels. Due to its ageing process, there's some sediment in the bottles, similar to what happens with wine. What does Gold of Mauritius Dark Rum taste like? The Flavor Spiral™ shows the most common flavors that you'll taste in Gold of Mauritius Dark Rum and gives you a chance to have a taste of it before actually tasting it. Slight musty cork-like note with dark chocolate, hot sawn wood and peanuts. Walnuts, wet cardboard, some more walnuts and sweet dark chocolate covered peanuts with peppery alcohol prickle. Fiery finish with walnuts, dark chocolate and oak. Having been lucky enough to travel to Mauritius for my honeymoon I made it my personal side mission to try as many Mauritian rums as possible. Without doubt, this was my favourite and came home with me on the plane. I think my wife is still there? Deliciously smooth, and well balanced well worth a try. This is a young, intencsive and jumpy rum suitable well as a substitute to a Highland malt. Nice, smooth Rum with a sweet, chocolatey palate. Velvety smooth, peppery punch for a finish. Great rum and I don't usually go for a neat dram of the stuff. Very nice. I wish I could get a bottle of this. One of my all time favourites. Like some tropical island captured in a bottle. Not sure why I'm getting rum. I don't like this type of alcohol. Best served by not. Absolutely a must for a bar for a great dark rum! Slightly smokey and very smooth! I want a bottle! Loved it. Excellent and really smooth rum. I think it might even be smoother than Ron Zacapa, my another favorite. I really like the base of this rum and I enjoy it straight.